Thyroid volume (TV) has been found to be associated with age, anthropometry, smoking, iodine status and hyperinsulinemia. Hyperinsulinemia is frequent finding in patients with PCOS and has associations with TV. However, the TV has been evaluated only a few studies in patients with PCOS. Therefore, the aim of this study was to evaluate the biochemical and hormonal variables in patients with PCOS comparing with the controls and their relationships between TV. This was a case–control study conducted in a training and research hospital. The study population consisted of 47 reproductive-age PCOS women and 30 control subjects. We evaluated anthropometric, biochemical and hormonal parameters as well as thyroid volume in PCOS patients and controls. Insulin resistance was calculated using the homeostasis model assessment insulin resistance index (HOMA-IR). Mean age, BMI, thyroid stimulant hormone (TSH) levels and TV were similar between groups (p<0.05). The HOMA-IR and free T4 levels were higher in patients with PCOS. However, hyperinsulinemia and insulin resistance were not found to be associated with TV. Thyroid volume was positively correlated with the LH and anti TPO levels. The participants were divided into 2 groups according to HOMA-IR levels. The mean TV measurement was higher in group with higher HOMA-IR levels, but the difference was not significant in young age PCOS patients. In early age PCOS patients it was observed that insulin resistance had no effect on TV. In this case, anti TPO and LH have dominant effect on TV. Chronic stimulation with LH and insulin may lead to increase in TV in later stages of the PCOS diseases. Polycystic ovary syndrome (PCOS) is one of the most common endocrine disorder affecting at least 5 to 10% of women of reproductive age . PCOS is characterized by hyperandrogenism, menstrual disturbance, anovulation, infertility and obesity  and is reported to be associated with an increased risk of cardiovascular disease (CVD)  and early atherosclerosis . Hyperinsulinemia and insulin resistance are frequent findings in patients with PCOS and have associations with thyroid volume and nodular thyroid diseases . In recent studies, thyroid volume (TV) has been found to be associated with age, anthropometry, smoking, iodine status and hyperinsulinemia [5–8]. Additionally, growth hormone and growth factors such as insulin like growth factor, epidermal growth factor have been shown to affect TV [9, 10]. Furthermore, endogen TSH stimulation has been shown to increase thyroid gland size . Luteinizing hormone is a glycoprotein hormone like TSH and has similar alpha subunit. Additionally, the LH has been identified to increase thyroid adenylate cylase activity [12, 13]. It has been known that the LH levels are higher in patients with PCOS compared with the controls even in follicular phase [14, 15]. The goiter prevalence is more common in women than in men regardless of population . The higher incidence of thyroid diseases in women is previously attributed to the higher estradiol levels. Estradiol has been shown to enhance proliferative and mitogenic activities of thyroid cells [17, 18]. But, in recent years chronic estradiol treatment has been shown to reduce volume densities of follicles, follicular epithelium and thyroid gland [19, 20]. Therefore, the aim of this study was to evaluate the biochemical and hormonal variables in patients with PCOS and their relationships between TV. We studied 47 patients with PCOS and 30 age- and body mass index (BMI) - matched healthy controls. We studied in a mild iodine deficiency area. The protocol was approved by the local ethics committee. All patients gave a written consent. All patients were female and non-smokers. This was a prospective case–control study conducted in a training and research hospital between September 2011-March 2012. The control group (n=30) consisted of healthy patients who were admitted to check-up unit without any systemic disorder. All of the women in the control group had hirsutism score <8. All women in the control group had regular menses, every 21–35 days. None of the women in the control group had polycystic ovary on ultrasound. Those participants who had a smoking history, diabetes mellitus, hyperprolactinemia, congenital adrenal hyperplasia, androgen-secreting tumours, thyroid disorders including thyroid parenchyma heterogeneity and/or nodular disease on ultrasound and/or thyroid function abnormalities, Cushing syndrome (1 mg dexamethasone suppression test was done all PCOS patients and obese control who had a BMI greater than 30), infection diseases, hypertension, hepatic or renal dysfunction were excluded from the study. The participants under the age of 18 and over the age of 35 were excluded from the study. The participants were also excluded if they had used confounding medications, including oral contraceptive agents, antilipidemic drugs, hypertensive medications, and insulin-sensitizing drugs, within 3 months before enrolment. Weight and height were measured in light clothing without shoes. The BMI was calculated by dividing the weight by the square of the height (kg/m2). The waist circumference was measured at the narrowest level between the costal margin and iliac crest, and the hip circumference was measured at the widest level over the buttocks while the subjects were standing and breathing normally. The waist-to-hip ratio (WHR) was then calculated. The degree of hirsutism was determined by the Ferriman-Gallwey (FG) score . The BMI, WHR and hirsutism scores were assessed by a single investigator for all of the subjects. Venous blood samples were obtained in the follicular phase of a spontaneous or progesterone-induced menstrual cycle. Before the study, blood samples were drawn from each patient after a 12h overnight fasting for the determination of the hormones, lipid profile, high-sensitive C- reactive protein (hs-CRP), insulin and glucose levels. Plasma glucose was determined by the glucose oxidase/peroxidase method (Gordion Diagnostic, Ankara, Turkey). The serum levels of follicle-stimulating hormone (FSH), luteinizing hormone (LH), prolactin, dehydroepiandrosterone sulphate (DHEAS), total testosterone (T), insulin, free thyroxin (fT4), thyroid stimulating hormone (TSH) and thyroid peroxidase anti-body (anti-TPO) were measured with specific electrochemiluminescence immunoassays (Elecsys 2010 Cobas, Roche Diagnostics, Mannheim, Germany). The levels of total-cholesterol, high density lipoprotein cholesterol (HDL-C), and triglyceride (TG) were determined with enzymatic colorimetric assays by spectrophotometry (BioSystems S.A., Barcelona, Spain). The low density lipoprotein cholesterol (LDL-C) level was calculated using the Friedewald formula. Serum hs-CRP was determined using high-sensitive CRP immunonephelometry (BN, Dade-Behring; Marburg, Germany). Insulin resistance was calculated using the homeostasis model assessment insulin resistance index (HOMA-IR) , according to the following formula: fasting plasma glucose (mmol/L) × fasting serum insulin (mU/mL)/22.5. The cut-off value was taken as 2.7 for HOMA-IR . Thyroid volume was assessed using a high-resolution ultrasound machine (Hitachi, Japan; EUB 7000) with a 6–14 megahertz high-frequency linear transducer. Thyroid volumes were calculated by multiplication of three diameters and the constant value 0.52. Collected data were entered to SPSS version 17. Continuous data were shown as means ± SD. Chi-squared tests were used to compare differences in rates. Normally distributed variables were compared using the Student T test; nonnormally distributed variables were compared by the Kolmogrow Smirnov Test. The degree of association between continuous variables was calculated by the Pearson correlation coefficient. The multiple linear regression using the stepwise method was used to determine the independent predictors. A p value lower than 0.05 was accepted as statistically significant. Clinical, biochemical and hormonal parameters were screened in the patients with PCOS and in the healthy control subjects (Table 1). We studied 47 patients with PCOS (mean age 23.27 ± 5.83 years, range 18–33 years; BMI, 24.41± 4.39 kg/m2) and 30 age- and BMI- matched healthy controls (mean age 22.80±4.4 years, range 18–32 years; BMI, 23.64±3.35 kg/m2). HOMA-IR: homeostasis model assessment insulin resistance index; HDL-C: high density lipoprotein cholesterol; LDL-C: Low density lipoprotein cholesterol; hs-CRP: high-sensitive C- reactive protein. The mean fasting glucose, insulin, HOMA-IR, triglyceride, hsCRP, DHEAS, prolactin, fT4 levels were significantly higher and the estradiol levels were significantly lower in the patients with PCOS (p<0.05) (Tables 1, 2). The mean TV was 10.13±3.98 mL in PCOS patients while 10.46±4.36 mL in healthy control women (p=0.734). The number of anti-TPO positive women was similar between groups (p: 0.456). fT4: free thyroxine; TSH: thyroid stimulating hormone; FSH: follicule stimulating hormone; LH: luteinizing hormone; PRL: prolactin; DHEAS: dehydroepiandrosterone sulfate. A significant positive correlation was found between the TV, anti-TPO and LH (r: 0.602, p<0.0001; r: 0.316, p: 0.007). However, hyperinsulinemia and insulin resistance were not found to be associated with TV. In multiple linear regression analyses TV was significantly associated with LH (beta coefficient=0.377, p<0.001), anti-TPO (beta coefficient=0.444, p<0.001) and TSH (beta coefficient= −0.309, p=0.004) (age, BMI, FSH, estradiol and HOMA-IR were included in the model). The participants were divided into 2 groups according to HOMA-IR levels. The cut-off point was 2.7 . Those participants who had a HOMA-IR greater than 2.7 had significantly higher hsCRP levels. Although, the mean TV measurement was higher in group with higher HOMA-IR levels, the difference was not statistically significant (Table 3). fT4: free thyroxine; TSH: thyroid stimulating hormone; hsCRP: high-sensitive C- reactive protein; FSH: follicule stimulating hormone; LH: luteinizing hormone. The correlation between LH and TV was shown in Figure 1. The relationship between total thyroid volume and luteinizing hormone. The results of the present study demonstrate that the mean TV measurements were similar in the early age of PCOS patients and the control group. Furthermore, insulin resistance had no effect on TV in the early age participants. However, the TV showed a significant correlation with LH and anti-TPO. It has been shown that insulin had mitogenic effect on thyrocyte. Additionally, in recent studies hyperinsulinemia and insulin resistance has been found to be associated with TV [5, 25]. However, in the present study hyperinsulinemia and insulin resistance were not found to be associated with TV. But, when we divided participants into 2 groups according to the presence of insulin resistance, we observed the higher TV measurements in insulin resistant group, but the difference was not statistically significant. It is thought to be due to lean and young participants. Human chorionic gonadotropin (hCG) secreting placental tumours such as hydatidiform moles and choriocarcinomas have been found to be associated with hyperthyroidism . Furthermore, the HCG has been reported to increase TSH receptor expression, thyroid hormone secretion, iodide uptake, organification, adenylate cyclase, and deoxyribonucleic acid synthesis in rat and also cultured human thyrocytes [27–29]. Luteinizing hormone is a glycoprotein hormone like TSH and has similar alpha subunit. In Carayon et al. study LH has been identified to increase thyroid adenylate cylase activity 65 times more potently than HCG in human thyroid membranes . Also, in Yoshimura et al. study human LH has been found to be more potent than HCG in binding to the TSH receptor and stimulating adenylate cyclase . As mentioned, HCG and LH have thyrotrophic effect in rat and human thyroid membrane. In present study, in consistent with these studies LH was positively correlated with TV and in regression analyses LH was obtained to be an independent risk factor for increased TV, regardless of age, BMI and anti TPO. The higher incidence of thyroid diseases in women is previously attributed to the higher estradiol levels. Estradiol has been shown to enhance proliferative and mitogenic activities of thyroid cells [17, 18]. However, recently it has been shown that chronic estradiol treatment led to significant decreases in volume densities of thyroid follicles, follicular epithelium and epithelial height . In another study 3712 women were evaluated and found that oral contraceptives were related with a lower thyroid volume and reduced risk of goiter. In this study the oral contraceptives users had goitre four times more lower than non-users . In this case, the LH suppression with oral contraceptives might be the factor for decreased thyroid volumes consistent with the present results. This suggests to us, endogenous elevated estradiol levels lead to increases in thyroid volume, while exogenous estradiol treatment leads to decreases in thyroid volume probably as a result of LH suppression. 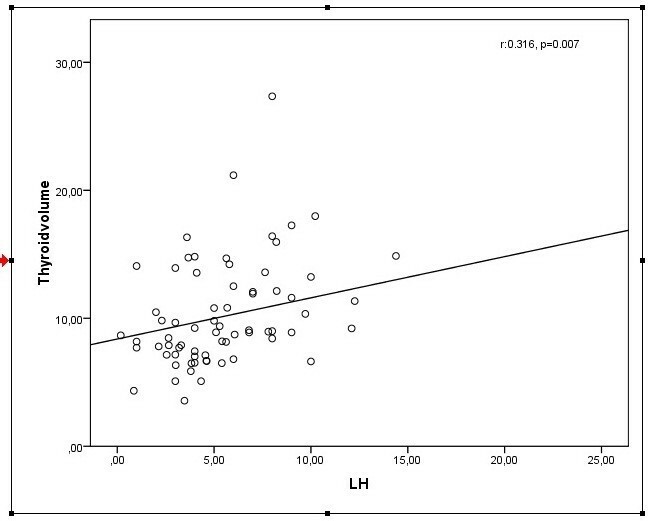 The present study clearly shows that increased LH levels are associated with increased TV. Furthermore, anti-TPO, TSH and LH levels were found to be independent risk factors for increased TV. However, the lack of the association between insulin and TV might be due to lean and early age PCOS patients as well as short disease duration. Chronic stimulation with LH and insulin may lead to increase in TV in later stages of the PCOS diseases. The study has some limitations. The sample size was small and the participants were lean and young age. The women with PCOS had higher LH levels in comparison to controls; however the difference was not significant which might be related to small sample size. Therefore, the further case control clinical studies are needed to evaluate the association between the gonadotropins and the TV. EC: have made contributions to conception and design, acquisition of data, and analysis and interpretation of data. MS: have made contributions to conception and design, acquisition of data, and analysis and interpretation of data. OT: have made contributions to acquisition of data. NC: have made contributions to acquisition of data. BK: have made contributions to acquisition of data. AG: have made contributions to acquisition of data. MA: have made contributions to acquisition of data. IU: have made contributions to acquisition of data. ET: have made contributions to acquisition of data. BU: have made contributions to acquisition of data TD: have made contributions to conception, design and interpretation of data. All authors read and approved the final manuscript.